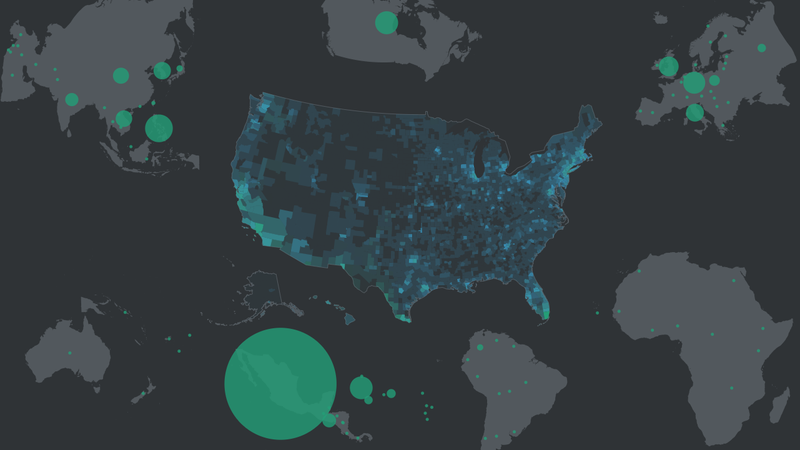 Perhaps the best way to prove that the US is indeed a country of immigrants is to watch the data speak for itself in this beautiful interactive map. This map is one of several just published by a new project called American Panorama, a “digital historical atlas.” It’s a collaboration between data viz wizards Stamen Design and the University of Richmond’s Digital Scholarship Lab to bring information to life in a rich, meaningful way, but also share the experience with the public by making the tools open-source. Drawing from University of Richmond’s vast digital archives, these maps manage to add historical context in a way that feels like it’s integrated into the experience, not tacked on. An interactive map of Overland Trails that shows how pioneers reached the American West is enriched by diary entries which are geolocated to where they were penned. This is data storytelling at its very finest and I’m really looking forward to seeing what other topics American Panorama covers. So far, upcoming plans include Great Depression, urban renewal, and presidential voting.